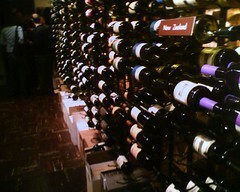 Colorado Wine Company is now open until 11pm on Thursday, Friday and Saturday!! Now that is worth celebrating. 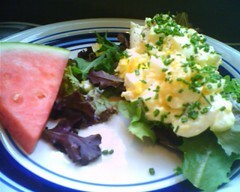 My latest obsession has been to attempt to try everything at Euro Pane Bakery run by a former LaBrea Bakey pastry chef. I was thinking of the doing another photo montage like my Zankou post, but then I'd figured who'd want to look thru a photo montage of pasteries? And besides, been there done that. The Euro Pane interior space is a clean any-mini-mall looking food joint which will not excite anyone. The real story here is the baked goods and food. The most amusing thing is when you get in line, you can see every patron in front of you stretching their necks, bending knees, leaning over, bending right and left - looking to see what goodies are in the display case. And of course, I get into the action as well. 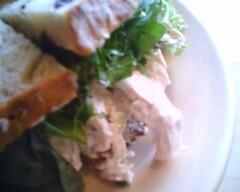 On another visit, I had the Chicken Salad sandwich with thick chunks of moist chicken with a light coat of tyme mayo. 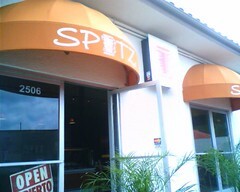 We interrupt this blog for some more Spitz news.... Now they are open 7 days a week!! How can you not celebrate another day to enjoy a doner kabob. And remember, especially in this heat wave, they also have some great gelato. See you there! Just moved into Eagle Rock. Now I'm cruising up and down Colorado Blvd and vicinity for some good chow. Let's eat. ColoradoChow Back in the House!